It is a common occurrence whereby a person would turn his mobile phone when you are in a class, or in a meeting, or sleeping or traveling via night coach with the unfortunate habit of not sleeping at night. While traveling here and there might not be all that common for you, you might just go to class or in a meeting pretty much every day. If not that, you at least sleep every night. The point here is that you toggle the silent mode on and off at least six or eight times during a day. Sometimes, it so happens that you forget to do that and when your phone rings, everybody glares at you as if you committed a horrific murder of some sort which turns out to be really embarrassing for you too. If not that, there are chances that a few of your friends who can’t sleep would end up bothering you waking you up in the middle of the night and therefore completely destroying your sleep. 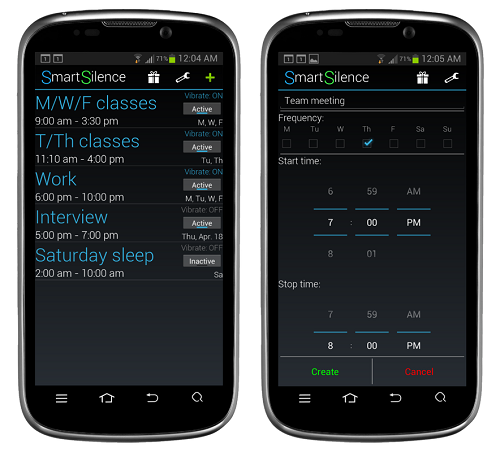 One of the members from the famous XDA developers came up with an application called SmartSilence. It will essentially just automate the process of throwing your phone into the silent mode according to the schedules you set. Settings for different days are available allowing you to set the time for when the phone goes silent and when comes back to life again. You also have the option to toggle a notification which will make your phone vibrate one when it has been turned silent. If your phone has automatically been turned silent, and on-going notification will appear in the notifications area and tapping it would nullify your current schedule. Rest assured that the phone will proceed to follow other schedules just the way you set them. You will also have the option to toggle the schedule on and off from the main screen, set the times and the days for when the schedule is supposed to be active. There are many applications that might serve the same purpose but this one is completely simple and runs flawlessly on your handheld device. It is not difficult to set up and pretty smooth to get a hold of. The application is compatible with device running android OS 2.0 and higher. It is available for free on the Google Play Store and you will not even be bothered by different advertisements. Give it a shot and let us know what you think.